Organ Music: Pulling Out All the Stops The organ has been described, along with the clock, as the most complex of all mechanical instruments developed before the Industrial Revolution. Miles Hoffman unravels the complexities and the mysteries of the musical giant. 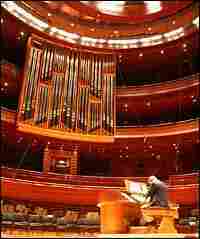 John Ourensma of Dobson Organ Builders tests the new organ at the Kimmel Center in Philadelphia. The organ has been described, along with the clock, as the most complex of all mechanical instruments developed before the Industrial Revolution. Mozart called it the king of instruments. 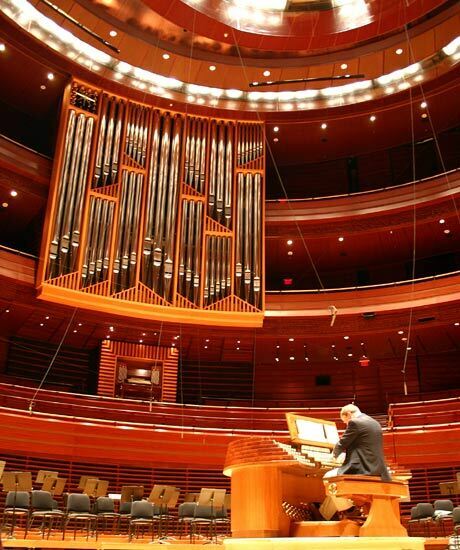 The largest concert-hall organ in the United States — all 32 tons of it — recently made its debut at Philadelphia's Kimmel Center for the Performing Arts. "Millions of people hear the organ every weekend ... in church, but how the thing works does remain kind of mysterious," music commentator Miles Hoffman says. It was none other than Mozart who first declared the organ the "king of instruments." He was most likely swayed, as so many others have been, by the immensity and nobility of the organ's sound, and by the tremendous variety of sounds the instrument can produce. Mozart was also certainly aware of the organ's long history, and of its leading role in the development of such important musical forms as the fantasy, the prelude, the toccata, and the fugue. The organ is a hybrid, a combination wind instrument and keyboard instrument. It's a wind instrument because it produces sound by means of air vibrating in pipes. And it produces different notes (that is, notes of different pitch) by setting the air vibrating in pipes of different lengths: the longer the pipe, the longer the vibrating air column and the lower the pitch. The shorter the pipe, the higher the pitch. The pipes of an organ sit on a "wind chest." There are various types of organs, but they all have some mechanism to force air at steady pressure into the wind chest and from the chest into the bottoms of the pipes. To play the instrument, the organist uses keyboards and pedals. The pedals are like an extra set of keys, but played with the feet. (Their function is not in any way related to that of piano pedals.) In fact the keys and pedals are really just one end of a system of valves that open and close the pipes at the bottom, allowing forced air in or shutting it out. But what about the "tremendous variety of sounds" an organ can produce? On a piano, the way the player depresses the keys (the "touch") determines the quality of the sound. But on an organ, this is not the case: the function of the keys is strictly to control which pipes will be opened. With certain minor exceptions (and no exceptions in the case of organ keyboards that operate electrically), the touch has nothing to do with how the notes will sound. The "how" is determined by the pipes themselves. Variations in the materials, shape, and functional design of organ pipes can produce effects ranging from subtle gradations of tone color to drastic differences in volume and character of sound. The reason the organ offers such a remarkable panoply of sounds is that many different types of pipes can be used -- separately or simultaneously -- to play the same notes. Most organ pipes are metal, some are wood. They range from the size of a pencil to monsters that are thirty-two feet (or even sixty-four feet) long and a foot and a half to two feet in diameter. The pipes are organized in sets of similar type and sound quality called "ranks," with most ranks encompassing the entire range of notes on the keyboard, one pipe per note. (Some ranks cover only the notes played by the pedals.) Most organ keyboards span sixty-one notes, and a large organ may have as many as fifty, seventy-five, or one hundred or more separate ranks. The result? Lots of pipes. To give a simplified example: if an organ has eighty ranks of pipes and a keyboard span of sixty-one notes, and if each rank covers the entire keyboard span, that organ will have almost five thousand pipes. Four thousand eight hundred eighty, to be exact, or 80 × 61, not counting the pedal ranks. Some very large organs have as many as ten thousand pipes, or even twelve thousand. In fact, everything about the organ has to be simplified to discuss at anything less than book length, because the instrument is so complicated. Also, although there are certain conventions in organ building and certain general types (based on the nature of the keyboard/valve systems), there is no such thing as a standard organ. The organ builder -- in consultation with the client and after considering such factors as the size, acoustics, and design of the church or concert hall for which the instrument is intended -- determines the size, shape, pipe arrangement and exterior decoration, interior works and mechanisms, kinds of pipes, number of pipes, and possibilities of combining pipes for each individual organ. STOP: A stop is a set of pipes. It may consist of one rank of pipes, or it may include multiple ranks. If an organist selects a stop that combines ten ranks of pipes, for example, then depressing any key on the keyboard will open ten pipes (all tuned to the same note) simultaneously. Because the ranks all have different sounds, the stops an organist chooses will determine the organ's sound at any given moment. Stops have names that reflect either what kinds of pipes they're composed of or how they sound. Some of these names are simple, like Flute, or Trumpet, but others are a bit more esoteric: Nazard, for example, or Furniture IV, or Contra Salicional, or Tierce, or Double Open Diapason. To complicate matters, stop is also the name for the knob or other device (mechanical or electric) that controls the flow of air to the set of pipes in a particular stop. A stop controls a stop, in other words, bringing it "on-line" or taking it "off-line" by opening or closing the air passages to its pipes. Stops are arrayed on the organ console, or control board: mechanical stops are usually knobs, and electric stops are usually tabs or buttons. Mechanical stops, which are attached to rods and levers, are pulled out to open stops, and pushed in to close them. The expression "to pull out all the stops" comes from organ terminology, and is believed to have been first associated with Johann Sebastian Bach. Bach was famous in his time not just as a great organist, but also as a great organ tester, and whenever he tried a new organ his practice was to start off by playing with all the stops pulled out, that is, with every rank of pipes on-line at once. (Just to be clear: if an organ had fifty ranks, then for each note Bach played on the keyboard fifty pipes would sound simultaneously. If he played ten notes at once, five hundred pipes would sound.) In this way, he said, he could see what kind of "lungs" an instrument had. REGISTER: Register is another word for the complete set of pipes -- one rank or multiple ranks -- that makes up one stop. That is, register is another word for stop. REGISTRATION: The registration is the specific set of stops and stop combinations used to play a piece, or passage, of music. Registration is also the art of choosing stops, of knowing which kinds of sounds will work most effectively with a particular piece or passage and which combinations of pipes will produce those sounds. Before the nineteenth century, composers rarely indicated which registrations to use in their compositions. Registration was considered part of the art of the performer, not of the composer, and for the most part was left up to the organist. This attitude changed considerably during the course of the nineteenth century, however, and modern composers tend to be quite fastidious about specifying registrations. MANUAL: Manual is another word for keyboard, but specifically one played with the hands. (The array of pedals is called the "pedal keyboard," and usually covers thirty-two notes.) Most organs have at least two manuals, but there are often as many as four, and sometimes up to seven. Each manual controls a different "division" of the organ, meaning a different group of stops. Manuals can also be "coupled," however, so that one manual's control is extended over other divisions. BELLOWS: Organs have existed in one form or another for over two thousand years. The earliest organs, those of the ancient Greeks and Romans, used hydraulic pressure -- created by water rising and falling in a closed system of tubes and reservoirs -- to force air into pipes. Later organs all depended on bellows for their pressurized air supply. Some bellows were operated by hand, some by foot, but either way, the organist himself didn't operate them. Someone else did, or, in the case of large organs with multiple bellows, a whole team of people did. By the turn of the twentieth century, bellows systems had given way to electric blowers, and organists were finally free to play their instruments without assistance. TRACKER ORGAN: An organ whose keyboard/valve system is mechanical, as opposed to electric. A tracker is a rod, usually of wood, that connects a key or pedal with the valve that opens and closes a pipe. From about the fourteenth century until the age of electricity, all organs were tracker organs. Tracker organs fell out of fashion for a number of decades in the wake of the industrial revolution, but they have made a strong return, and are preferred by many modern organists and organ builders. Perhaps the greatest reason for their renewed popularity is that with "tracker action" there's a direct (mechanical) connection between how fast the keys are depressed and how fast air is allowed into the pipes, which allows the organist somewhat more control of the sound. ELECTROPNEUMATIC ORGAN: An organ whose keyboard/valve system is operated by a combination of electricity and air pressure. The keyboard functions as a kind of electric switchboard. Depressing a key closes an electric circuit, which activates a magnet, which deflates an air-filled leather pouch, which pulls down a "pallet," or valve, which opens a pipe. When the key is released, the circuit opens, the pouch reinflates, the pallet goes up, and the pipe is closed. ELECTRIC ORGAN: In some organs, the keyboard/valve system is strictly electric. The key closes a circuit, which activates a magnet, which pulls a valve directly to open a pipe. ELECTRONIC ORGAN: A keyboard instrument that sounds like an organ but produces sounds electronically, without pipes. 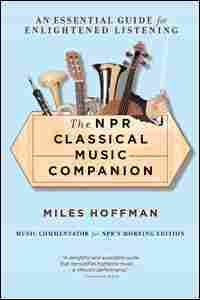 From The NPR Classical Music Companion by Miles Hoffman, copyright 1997 by Miles Hoffman and National Public Radio. All rights reserved.